← What was the Star of Bethlehem? UPDATE: Unisa, who hosted the first leg of the tour which I write about below, have released their own report on the event here. by Professor Charles McGruder, Dr Robert Williams and Dr Jeffrey Hoffman. I attended the first lecture which was presented in the Great Hall of the University of South Africa on Monday 9 November 2010. The event was well attended by university staff, the press and the general public. There were even a number of children in the audience, who made their voices heard when the floor was opened for questions to the panel. The evening opened with a welcoming speech by the Dean of the College of Science, Engineering and Technology, Professor Mamokgethi Setati, which highlighted the importance of Astronomy to the university. The speakers were then welcomed by Dr Gorden MacLeod, director of Astronomy Frontiers in the Department of Science and Technology. First up was Dr Jeff Hoffman, who has been a professional astronomer since 1966, and was selected by NASA in January 1978. 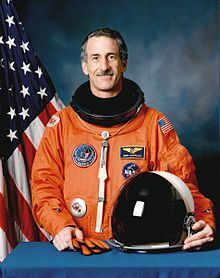 In his time as an astronaut he helped with development of a high-pressure spacesuit and preparations for the assembly of the International Space Station. He first went into space in 1985 and has flown on space shuttles Discovery, Columbia, Atlantis and Endeavour. He performed a record five spacewalks to repair the Hubble Space Telescope (HST) and was the first astronaut to log 1000 hours on board the space shuttle. He has also sported an impressive moustache, although I gathered from some of the photographs he shared in his presentation that this was the style amongst astronauts of the time. Dr Hoffman spoke mainly on the HST, although he gave ample background information on astronaut training, shuttle preparation, mission planning and so forth. Throughout his frankly fascinating talk, a continuous video presentation ran in the background showing footage of launches, imagery returned from the HST, and astronauts hard at work. Some of the most beautiful imagery was of astronauts working on the HST, engrossed in their tasks while floating alongside the orbiter with the earth shining gorgeously behind them. Dr Hoffman spoke quite casually of the work that was done, but it was clear that each hubble mission was significantly more ambitious and complicated than the one before, and as a result the HST is far more capable than its original designers had anticipated. It continues to do excellent work even as we begin construction of it’s successor, the James Webb Telescope which will be significantly larger and able to operate in different wavelengths of light. Dr Robert Williams was the next speaker. He is the current president of the International Astronnomical Union (IAU), the body responsible for (amongst other things) naming new astronomical bodies and setting standards and definitions for the field. He was awarded the Beatrice Tinsley Prize of the American Astronomical Society for his leadership of the Hubble Deep Field project, mankind’s deepest view into space which revealed the early universe with Hubble Telescope. For this project he was also awarded the NASA Distinguished Public Service Medal in 1999. He is also the Distinguished Research Scholar of the Space Telescope Science Institute in Baltimore, USA, which operates the HST for NASA. Dr Williams is a strong advocate for science education and outreach, and gives many lectures around the world on the discoveries about the universe which we have made through the Hubble. Dr Williams spoke on the state of modern astronomy. He began by showing us a sequence of the most iconic images produced by the HST, most of which have appeared in the mainstream press over the years. We saw Saturn in ultraviolet, showing off it’s aurorae and Jupiter covered in scars after colliding with comet Shoemaker-Levy 9 back in 1994. He showed us image after image of the gorgeous nebulae created by exploding stars, and incredibly detailed photographs of galaxies receding millions of light years away. He then spoke about extra-solar planets – planets which orbit stars other than our own Sun. These exoplanets are being discovered at such a phenomenal rate that they are no longer reported in the mainstream press. Even astronomical publications don’t bother listing them anymore – at more than 400, there are simply too many to list. Interestingly, only about a third of exoplanets have been directly observed – astronomers have had to infer the existende of the remaining 70%. The most common techniques, before we were able to directly image exoplanets, were the transit method, and the wobble method. When a planet orbits a star, Newton’s laws of motion tell us that the star will be swung around very slightly by the mass of the planet. If you can measure the position of a star accurately enough, you will detect this ‘wobble’, and then be able to infer the presence of a planet and calculate its mass and distance. Alternately, if we’re lucky to be positioned within the plane of a planet’s orbit, then we will see regular eclipses of the star by its planet. We will experience this as a tiny dimming of the star’s light. Again, with sufficiently sensitive instruments we can detect this dimming and time how long it took the planet to cross in front of the star. 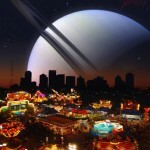 All these recent discoveries tell us that the universe is absolutely teeming with planets. The obvious question to ask is how many of these planets have life on them? While Dr Williams seemed very interested in the question and hopeful that the answer would be “Many”, he confessed that unfortunately the only honest answer was “We haven’t found any so far”. In other words, either there is no life off of Earth, or it’s there but we haven’t found it yet. Only by finding life can we ever answer the question for certain. After all this talk about life on other planets, Dr Williams moved to the subject of Black Holes. After briefly explaining their nature he discussed how the HST was able to provide the first direct proof that black holes exist, and that there is a supermassive black hole at the centre of our own Milky Way galaxy. The final major discovery that he talked about was dark energy. The classic big bang theory was abandoned decades ago in favour of refined models which were able to explain puzzling questions like how stars and galaxies could form from a perfectly smooth primeval explosion. But even these improved models put the cause of expansion entirely at the beginning of the universe, with the result that this expansion should be steadily slowing under the braking effect of gravity. This was simply an obvious intuitive fact, backed up by our understanding of physics since Sir Isaac Newton penned his law of universal gravitation. But observations by the Hubble showed that, rather than slowing down, the expansion of the universe is inexplicably accelerating! This news might not be new anymore but it’s still a total puzzle. Nothing we know offers any clue as to why this might be. Even Einstein’s ‘Universal Constant’, thrown in as a bandaid to reconcile relativity with the static universe we understood before Edwin Hubble discovered that the universe expands, doesn’t answer the questions – it’s just a term in an equation, with zero explanation of what it represents or how it works. So astronomers coined the phrase ‘Dark Energy’ to describe whatever it is that is pushing the universe apart from itself so that at least it has a name. But we are nowhere near coming up with an explanation, and that is very very exciting – this is an excellent time to be an astronomer! astronomy from the California Institute of Technology in 1965 and a doctorate from the University of Heidelberg in Germany in 1974. Prior to coming to Western Kentucky University (WKU), Prof McGruder spent time at Vanderbilt University, Fisk University and the University of Nigeria. He was also a visiting professor at Western Kentucky University in 1989-90. Prof McGruder has been at WKU since 1993. 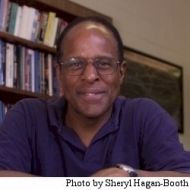 He was head of WKU’s Department of Physics and Astronomy from 1993 to 2002 and is a past president of the National Society of Black Physicists. 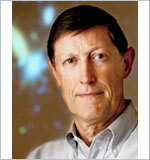 In 2005, Prof McGruder was appointed to the National Research Council’s Committee on Astronomy and Astrophysics. The committee, which is appointed by the president of The National Academy of Sciences, monitors the status of space- and ground-based astronomy and astrophysics and provides assessments to the National Science Foundation, NASA, and other institutions as a joint committee of the Space Studies Board and the Board on Physics and Astronomy. The overall objective is to encourage progress in astronomy and astrophysics and to assist the federal government in planning programs in these fields. His research interests include extrasolar planets, gamma ray bursts, and the construction of a worldwide network of fully robotic imaging telescopes. He also has worked on the proposed Kentucky Academy of Mathematics and Science at WKU. 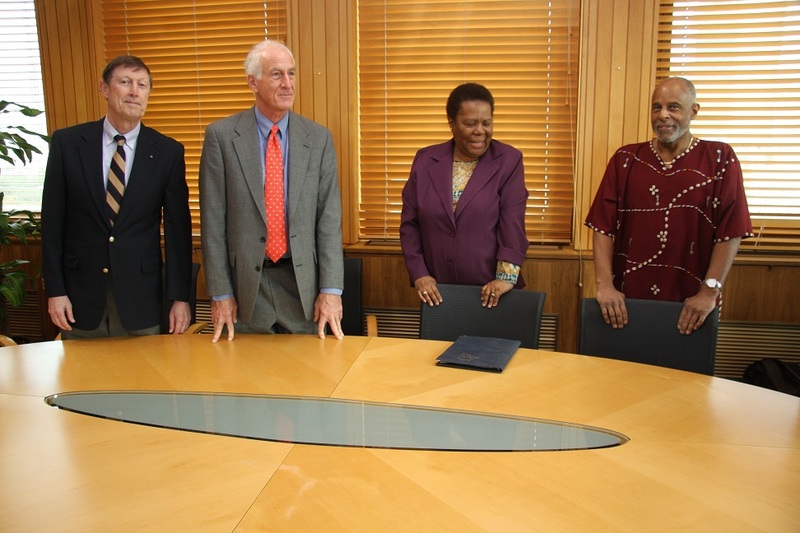 Prof McGruder spoke on the importance of building Africa’s capacity as a haven for astronomy. He explained how, along with dinosaurs, astronomy is one of the two most interesting sciences to the general public. By capturing people’s imaginations with astronomy, we can more easily build a population of innovative thinkers who question and probe the universe: scientists. The knock-off effects extend beyond research benefits as well – scientifically educated citizens are more emplyable, contribute to the economy, and are harder to oppress. 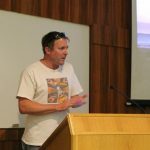 He pointed out how recent South African projects, such as the South African Large Telescope (SALT – technically the largest telescope in the world) and the KAT and MeerKAT radio telescopes have built South Africa’s reputation amongst the worldwide astronomical community enormously. For this reason he feels it is vital that South Africa win the Square Kilometer Array radio telescope (SKA) bid. SKA will bring enormous economic benefits to South Africa and not just through the massive investment required for construction and maintenance. SKA has extreme technological requirements which must be developed, invented, and implemented. SKA requires unprecedented amounts of internet bandwidth to be able to operate, which will benefit South Africa’s internet environment. The very best people in the world will congregate in South Africa to solve the engineering and computing challenges, and those skills and technologies will stay behind long after they have left. In fact, South Africa has already made great progress without outside help in the construction of MeerKAT, a large multi-dish radio telescope array which serves as a precursor project to SKA. The evening ended with all three speakers and Dr MacLeod answering questions from the floor. They answered a wide range of questions from audience members of all ages. One gentleman asked what the universe was expanding into – if the universe encompasses everything there is, then how could it be expanding at all?. Dr Williams answered by explaining that the universe is infinite in size – when we talk about the size of the universe we really mean the maximum possible size that we could ever see (limited by the speed of light and the age of the universe). An infinite universe can double in size but still remain infinite, because infinity times two still equals infinity. Therefore, there is no “outside” for the universe to expand into, since it remains infinitely large. But the most relevant question was from a man who wanted to know why South Africa has to use Russian resources to launch its own satellites into space, and what it would take to build our own launch facilities. Dr MacLeod answered by pointing out that South Africa used to have launch facilities, back when it still had a nuclear weapons program. The state-owned arms company (Armscor) did a great deal of work in developing large rockets able to deliver these weapons to a hypothetical target. With the regime change in 1994 though, the government made the decision to abandon the program, and the launch facilities are now mothballed. If we wanted to regain launch capacity, we would only need to purchase them from the arms company and upgrade them to modern standards. There is no immediate benefit to such actions, although the South African Space Agency will definitely head in that direction once it is formed. Overall the evening was tremendously exciting and informative. The speakers all drew on great depths of personal experience and were clearly enthusiastic about their subjects. Hopefully we will have more such visits in the future.